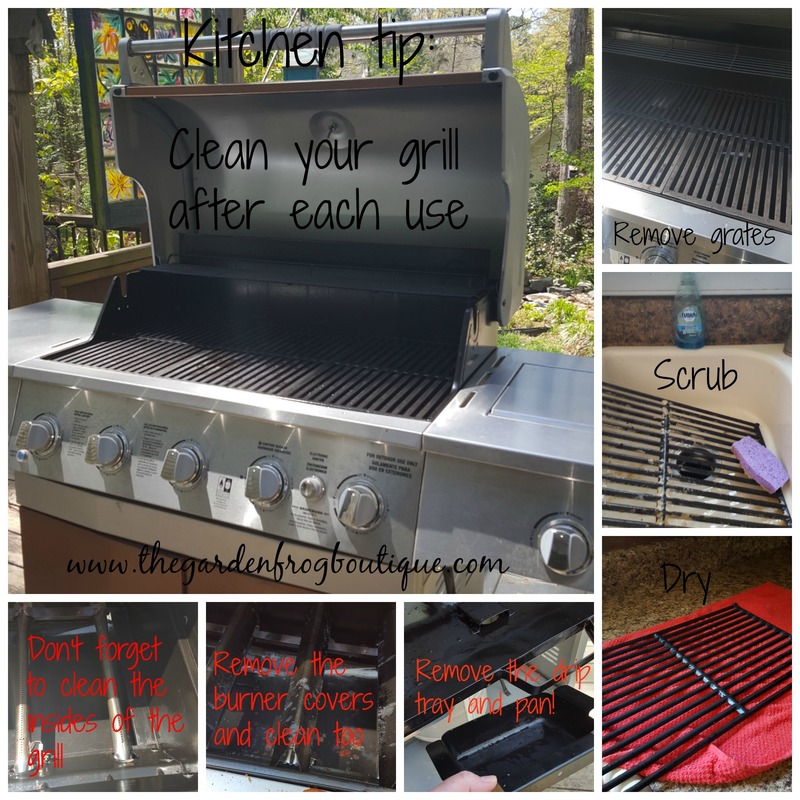 Kitchen tip: Clean your grill after each use. Why? Because who wants to fix food on a greasy, grimy, moldy grill? Do you really want to eat food that has been cooked on grates that haven’t been washed? 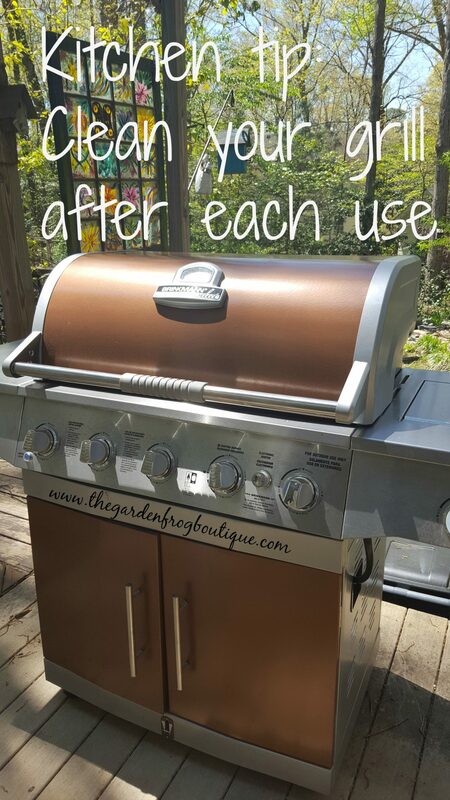 Plus if you clean your grill, this includes the grates, burner covers, and the drip pan underneath you can extend the life of your grill as well. If you bought the warranty, then having a clean grill almost ensures that the warranty company cannot deny your claim if they find you did not care for your grill properly. To clean your grill after each use may take you about 15-30 minutes at your kitchen sink. There are no fancy tools or soaps needed- just have an old scrubby or sponge, Dawn Dishwashing liquid (I prefer Dawn), and a towel off to the side to place the wet racks and covers. I first rinse the grate and then use an old sponge with some Dawn on it and start scrubbing. Sometimes rinsing frequently so I can see where I missed. The easiest way I found to clean the grates is to grab one rack at a time off the grill, scrub and rinse, and place on a towel to dry. It is so much easier to clean greasy grates one at a time than try to pile them in a sink. Now if your sink is not big enough then use a bucket and fill it half way up with water and use the sponge with Dawn and scrub- using the hose to rinse off the grill parts. After your grill is clean and the dry parts are put back on, then make sure to cover your grill. This is important to keep your grill looking good and keep your warranty valid. I speak from prior experience when I had purchased the warranty on a grill years ago and found out from the repairman that the warranty company will not cover a grill that has not been cleaned and stored properly. Fortunately for me I have always cleaned my grill but for those of you who just cook your food and then the next use you use one of the wire brushes thinking your clean is grill, well, you may want to reconsider how clean your grill really is. In my book 15-30 minutes is too much time for cleaning the grill. There must be some kind of technological solution for this. I think I would experiment and clean it with a steam cleaner machine instead. hahahaha I know this is a chore many do not want to do but it is important. thanks for stopping by!